Two fossil skeletons found in South Africa are members of a previously unknown species that fits in the transition between ancient "ape-men" and humans, scientists say. This fossil skull, found in South Africa in 2008, represents a new species of hominid that researchers say shared traits of both ancient australopithecines and more recent Homo species. 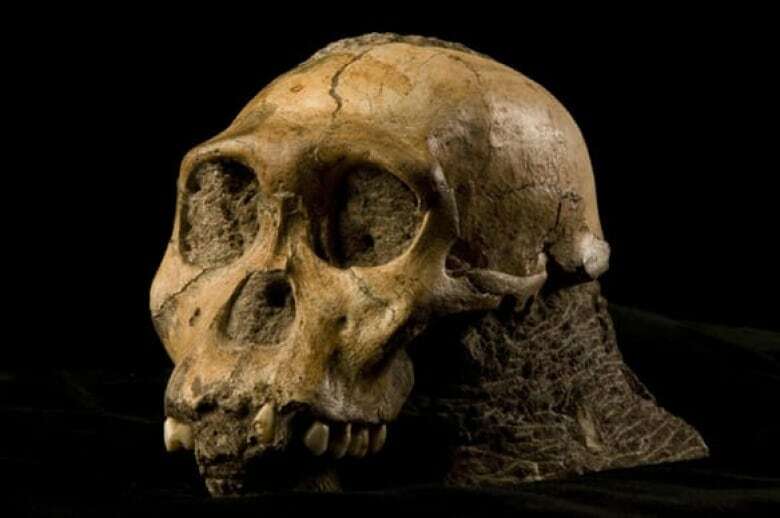 ((Brett Eloff/Lee Berger and the University of the Witwatersrand)) Two fossil skeletons found in South Africa are members of a previously unknown species that fits in the transition between ancient "ape-men" and humans, scientists say. The newly discovered species, named Australopithecus sediba, has characteristics of both primitive ape-like species and later humans, and the research team behind the find says it's the best candidate yet found for a direct ancestor of the lineage of humans. "These fossils give us an extraordinarily detailed look into a new chapter of human evolution and provide a window into a critical period when hominids made the committed change from dependency on life in the trees to life on the ground," said Lee Berger, a paleoanthropologist with South Africa's University of the Witwatersrand. Berger led the team that unearthed the two partial skeletons, described this week in the journal Science, but gives some of the credit for the discovery to his young son, Matthew. In August 2008, Berger was exploring caves near Malapa, north of Johannesburg, with his son, then nine years old. "Matthew ran off the site and within about a minute and a half said, 'Dad I found a fossil!'" Berger said. Berger thought the rock his son was carrying likely contained a fossil antelope bone, a common find in South African caves. It was, in fact, the collarbone of an ancient hominid. Berger explored and found more fossils. "When I got to the block and looked at it, there was a hominid mandible and canine sticking out of the back," Berger said. "So he did, in fact, make the first discovery." Matthew was originally listed as an author on the study, but Berger said Science nixed the idea. They returned to the site with a larger team in September 2008 and eventually found more than 130 fossils, including two partial skeletons. This diagram shows the fossil elements of the two partial skeletons of Australopithecus sediba. The grey shadows represent skeletons of Au. africanus, adjusted for different body proportions. ((Science/AAAS)) Berger says the two skeletons, an adult female and a juvenile male, have traits in common with both other Australopithecus species and members of the genus of humans, Homo. Australopithecines, like the famous "Lucy" fossil, have long arms, characteristic of good climbers. Species in the genus Homo have longer legs, making them good walkers. The new species, Berger said, has both. "It had committed in some ways to being a facultative terrestrial biped that could stride and walk like later (species) could," he said. "But it still was dependent upon the trees for some of its survival." It's tempting to call the new species a "missing link" between earlier species and modern humans, but scientists say the concept no longer applies, given new knowledge of human evolution. "The 'missing link' made sense when we could take the earliest fossils and the latest ones and line them up in a row," explained Smithsonian Institution paleontologist Richard Potts. "It was easy back then." Researchers now say the evolution of humans consisted of a number of diverse species in many branches, not a single smooth line from ape-like species to humans. Berger said the female was probably in her late 20s or early 30s, based on the wear seen in her teeth. The male could have been as young as eight. Both of the individuals would have been about 1.3 metres tall, although the young male would have grown taller, Berger said. At the time of their deaths, the female would have weighed about 33 kilograms and the male about 27 kilograms. The University of the Witwatersrand has invited the children of South Africa to come up with a common name, in the tradition of "Lucy" and "Ardi," for the skeleton of the young male. The fossils were found in a pit in what was once a cave. The bones fossilized in hardened sediment that buried them shortly after they died, possibly at the same time. A team of researchers led by Paul Dirks of James Cook University in Queensland, Australia, said the fossils are between 1.95 million and 1.78 million years old, based on uranium-lead dating, paleomagnetic dating and the fossils of other animals found at the same site, such as a sabre-toothed cat, mice and rabbits. 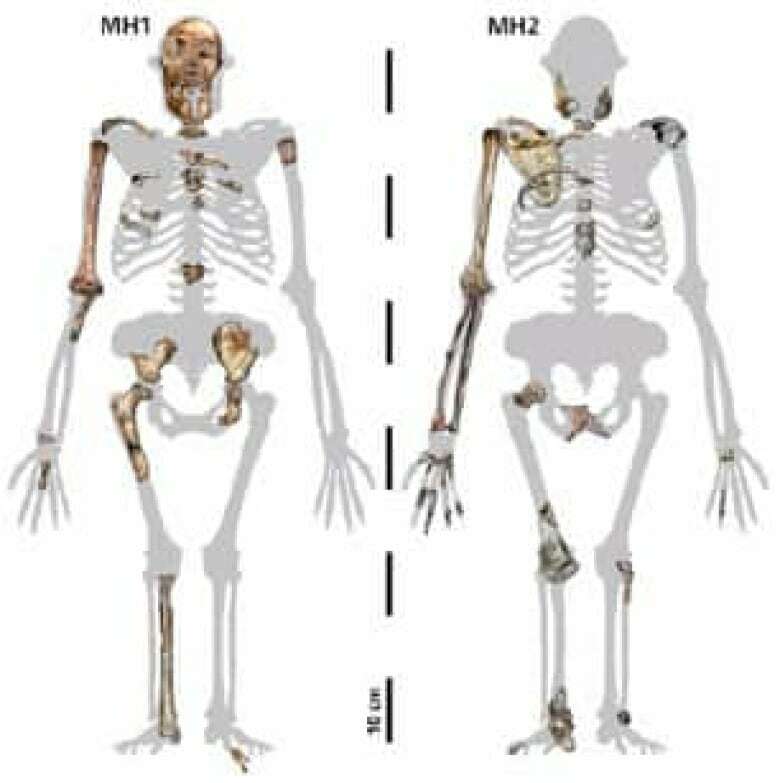 Australopithecus sediba is about a million years younger than Lucy, a member of the species Australopithecus. afarensis, which some scientists believe gave rise to a later species, Australopithecus africanus. "I believe that this is a good candidate for being the transitional species between the southern African ape-man Australopithecus africanus and either Homo habilis or even a direct ancestor of Homo erectus," Berger said. Berger said the name given to the new fossil was appropriate for "a species that might be the point from which the genus Homo arises." "Sediba" means "fountain" or "wellspring" in Sesotho, one of the official languages of South Africa. Berger's claim that the new fossils represent the direct ancestor of Homo is a controversial one, though. Paleontologists who have seen the fossils disagree on whether it represents an australopithecine or a member of Homo. Berger said the overall body plan of the new fossils — their small brains and bodies and relatively long arms — persuaded the researchers to place it conservatively with the australopithecines, although he acknowledged that certain traits of the skull and pelvis are also found in Homo. "The brain size of the juvenile was between 420 and 450 cubic centimetres," Berger said. That's smaller than a human brain, which is between 1,200 and 1,600 cubic centimetres. "The shape of the brain seems to be more advanced than that of australopithecines," Berger said. Pamela Willoughby, an anthropologist with the University of Alberta, says the discovery means there were now three known forms of early humans roaming around South Africa at the same time. "We're now thinking at every point in human evolution for the last six million years there was more than one human around, except the last 40,000 to 50,000 years," she said. Funding for the research was provided by the South African Department of Science and Technology, the South African National Research Foundation, the Institute for Human Evolution, the Palaeontological Scientific Trust, the Andrew W. Mellon Foundation, the AfricaArray Program, the U.S. Diplomatic Mission to South Africa and Sir Richard Branson, the billionaire founder of Virgin Group.